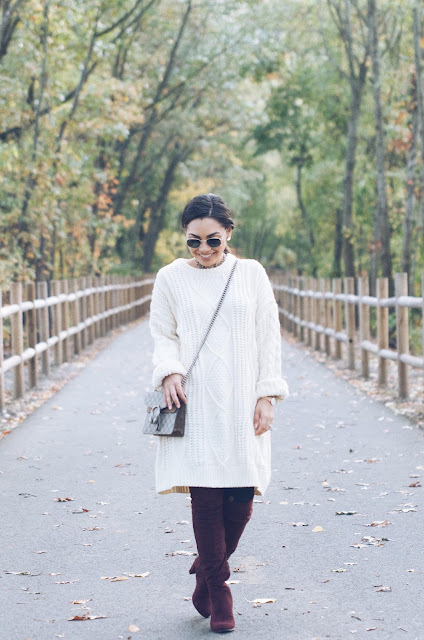 COZY SWEATER DRESS UNDER $50! Hello loves! I miss you guys. The weather is getting cooler and cooler and its time to bring out the cozy sweaters and boots. I love being cozy and its one of my favorite words to say! Everything has to be cozyyyy! I received in the mail this oversized cream sweater and it is so cozy you guys! You can easily wear it as a dress but I do recommend for cooler weather to wear a slip dress underneath. The sweater is currently on sale for under $50 and I found some more similar cute styles down below for you guys along with the boots. These boots are from H&M and are great quality and affordable. I am tempted to invest in the Stuart Weitzman boots but like most Libras I bought it in my cart and then purposely distract myself and leave it there! Does anyone else do that?! SIDENOTE: I have to apologize to you guys for being MIA. Since last Monday I have been fighting a stomach virus and trying to take better care of my mental health. While I was sick I suffered an anxiety attack at the same time and it really scared me. I think the virus symptoms scared me to think that I was having a heart attack and on top of that my husband was out of town so I was alone in our place. After I went to the doctors and was able to rest I toke a moment to sit back and try to pin point what happened. I would love to elaborate more on a future blog post because I think it was would therapeutic for me and a great way to get some insight from you guys. Anyways I hope you guys enjoy this post! This weekend my husband and I are visiting our hometown for the weekend to celebrate my baby sister birthday! Have a beautiful week loves!